Charged Hong Kong associate member Mr. Raymond Wu is ranked among the world’s top referrers in every round of Tesla Referral Program. He was rewarded with an invitation to the Tesla Model 3 Unveil Event on March 31, 2016 in Hawthorne, California, as well as tickets to the Gigafactory Grand Opening Party, and more! Locky Law (LL): Hello viewers! I am super excited to have Raymond here with us today to talk about how he becomes Asia’s Number 1 and one of the world’s best Tesla referrer, who will share his experience riding on the Tesla Model X and the latest Tesla Model 3! Welcome Raymond! 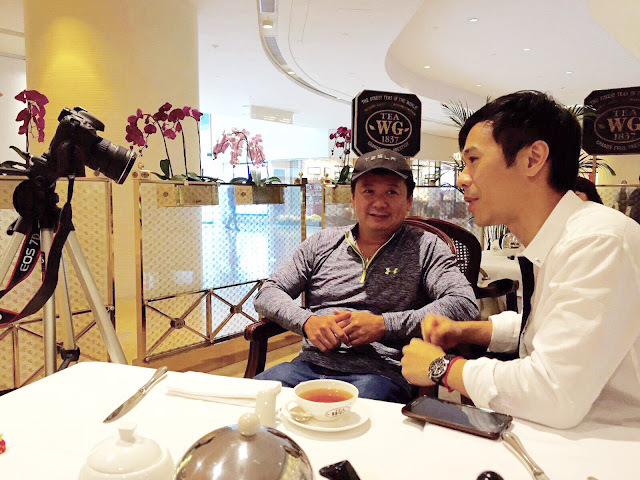 Raymond Wu (RW): Hello Locky, thanks for inviting me to be part of this interview! I hope you guys would enjoy my sharing! LL: First Raymond, you are very well-known in Hong Kong, probably in the entire Asia too, but for the sake of our world’s audience, please tell us about a little about yourself and your car? Singapore's Number 1 Tesla hero Mr. Joe Nguyen is a phenomenal figure at the world's stage. He's a true climate change fighter, sparing no expense in bringing in Singapore's first Tesla Roadster and also Singapore's first Tesla Model S P85. He overcame numerous challenges and paid ridiculous fines. Since then, he has shared his experience in numerous interviews and his story has been circulated around the globe. He was in Hong Kong for the weekend, and he's our guest of Charged Hong Kong Members' Stories #008. I refer to the article, “Electric shock – Tesla cars in Hong Kong more polluting than petrol models” (April 13). The Bernstein report quoted in the article presents a distorted picture, skewing the data to fit the author’s investment portfolio. Not surprising, given the report’s author’s oil and gas background and investments. The most outrageous distortion is the choice of HK Electric in the estimation of carbon intensity, while completely excluding CLP, whose carbon dioxide emissions are 30 per cent lower. CLP generates three-quarters of the electricity, and powers 70 per cent of the electric vehicles, in Hong Kong. Correct that one distortion, and the report result is reversed. Bernstein uses artificial fuel economy figures; production emissions are exaggerated, and the amount of carbon dioxide produced in the extraction, refinement and transportation of oil is understated. What are we waiting for? The time is now. This Earth Day and beyond, let’s make big stuff happen. Let’s plant 7.8 billion trees for the Earth. Let’s divest from fossil fuels and make cities 100% renewable. Let’s take the momentum from the Paris Climate Summit and build on it. Let’s start now. And let’s not stop. In order to support Mark's RTHK 3 interview, here's a mini-research I did this morning. Short, but I only cite what's creditable and authoritative. More information in the caption of each photo. Mark Webb-Johnson, Chairman, Charged Hong Kong, was a guest on this morning's RTHK Radio 3 Backchat radio program. Talking about EVs, the need for government incentives, environmental protection and our air quality. Of particular focus was the recent report from Investment research firm Bernstein with the ridiculous allegation that EVs pollute more than petrol vehicles. The report's author (Dr Neil Beveridge) is a 19+ year veteran of the oil and gas industry, holding an investment position in oil and gas stocks. He is hardly an independent authority. Let's try to avoid getting our environmental advice from an oil and gas investor. We'd rather listen to the dozens of academic papers from credible universities and private sector researchers, the environmental protection agencies around the world, and governments - all of whom are promoting and encouraging the switch to electric vehicles. Mark Webb-Johnson, arguably Hong Kong's most notable spokesperson for EVs. He has appeared frequently on the media since the very first EV set wheels on Hong Kong soil. The Number 1 go-to person to ask anything about EVs, moderator of Tesla Motor Club forums and now the heart and spine of Charged Hong Kong. He's our guest of Charged Hong Kong Members' Stories #007, he's our James Bond, and he's the Charged Hong Kong chairman. In Charged Hong Kong, everyone aims to contribute to a better future of Hong Kong. Some takes a more public approach, others work hard behind the scene. Member Mr. Eric Tang does both. In this issue of Charged Hong Kong Members' Stories #006, he will share with us the motivation behind his SCMP story as well as suggestions for the Hong Kong Government to improve on the situation at car parks.